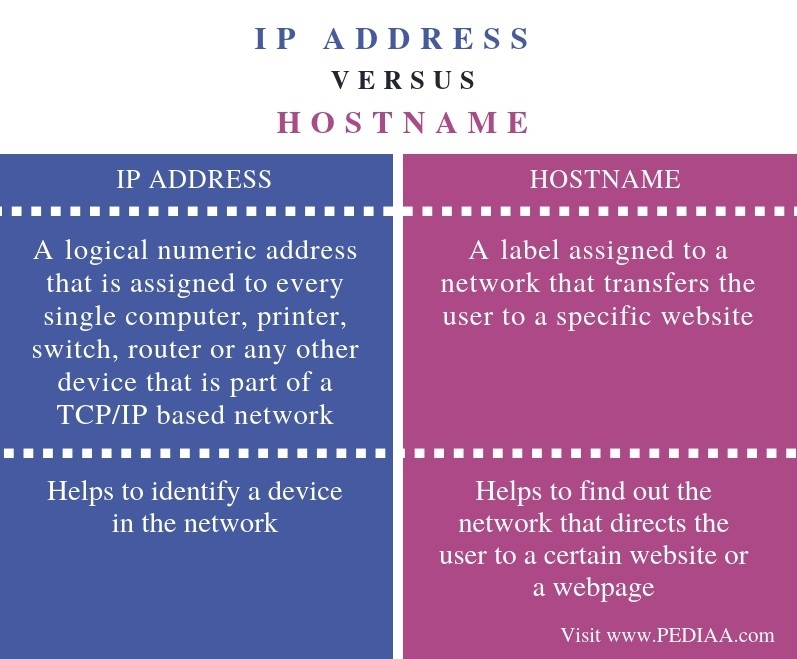 The main difference between IP address and hostname is that IP address is a numerical label assigned to each device connected to a computer network that uses the Internet Protocol for communication while hostname is a label assigned to a network that sends the user to a specific website or a webpage. A computer network is a collection of computers and other networking devices such as routers, switches, and hubs to exchange data and resource among multiple users. Each device in the network has an identification label called an IP address. Hence, this helps to locate a specific device in the network. In contrast, a hostname defines the network that transfers the user to a specific website or a webpage when browsing a network such as the World Wide Web (WWW). IP address stands for Internet Protocol Address. 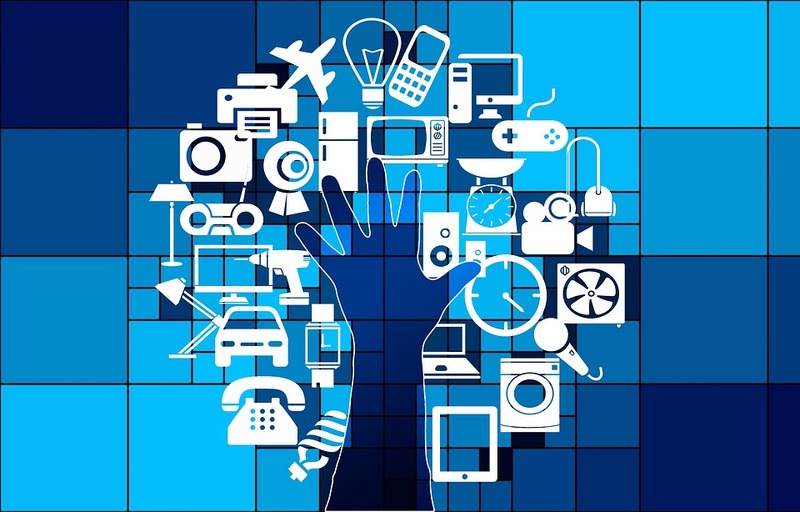 It is a logical address that helps to connect devices to the network. Moreover, it is possible to assign IP addresses manually or dynamically. There are two IP addressing versions as IPv4 and IPv6. The most common IP address version is IPv4. 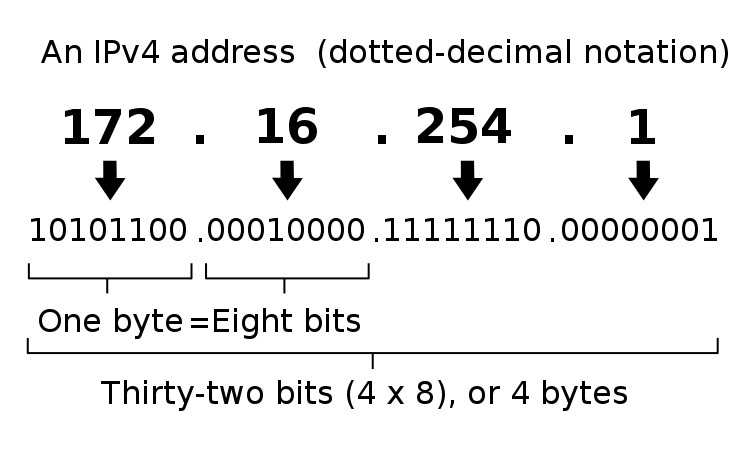 It is a 32bit address that has 4 bytes; each byte is an octet. An example is as follows. IPv6 has eight sets of four hexadecimal digits separated by colons. An example of IPv6 address is 2602:0445:0000:0000:a93e:5ca7:81e2:5f9d. According to the OSI model, the IP address works in the network layer. The router is a network device that works in the network layer. It sends data from one network to another. When the router receives a packet, it checks the IP address and sends the packet to the relevant network. If the packet is for its own network, it receives that packet. If the packet is not for its network, it forwards the packet to another network. Likewise, the router uses the IP address to forward the packets to the correct destination. The hostname helps to identify the network that directs the user to a certain website. When the user visits a certain website or a web page, the web address or the location is displayed on top of the web browser. This address is also known as the Uniform Resource Locator (URL). For example, assume www.microsoft.com. Here, the www section is the hostname. It specifies the network the user should visit in order to go to the website Microsoft.com. Furthermore, consider the URL, pcsupport.about.com. The ‘pcsupport’ section is the hostname. In images.google.com, the ‘images’ is the hostname. An IP address is a logical numeric address that is assigned to every single computer, printer, switch, router or any other device that is part of a TCP/IP based network. A hostname is a label assigned to a network that transfers the user to a specific website. This is the main difference between IP address and hostname. Another difference between IP address and hostname is that IP address helps to identify a device in the network whereas hostname helps to find out the network that directs the user to a certain website or a webpage. An IP address is a numerical label assigned to each device connected to a computer network that uses the Internet Protocol for communication. In contrast, a hostname is a label assigned to a network that sends the user to a specific website or a webpage. This is the main difference between IP address and Hostname. 1. IP Address – IPv4 vs IPv6 Tutorial, PowerCert Animated Videos, 4 July 2016, Available here. 2. Fisher, Tim. Lifewire, Available here.